Vises are mechanical tools that are used to support certain woodworks or metalworks on various work pieces by securing them to stay firm. Typically, standard bench vises are attached directly to a workbench for carrying out various operations like drilling, sawing, and planning. There are several types of vise that are available today, especially in e-stores. These varieties portray significant differences as they tend to work more aptly based on the nature of the work that needs to be done. In this article, we shall be acquainting ourselves with the various types of bench vices in order to properly understand how to perform DIY jobs regarding this tool in the right way. Also, considering the possible confusion as to what type to buy in the market, the different workbench vise types here will aid your knowledge concerning selections. Read on! There are numerous types of vises, all suited for different purposes. Below is a list covering a wide range of vices that you may find out there. They all have unique purposes for workshop activities involving a bench vice. Woodworking vice is one of the most popular tools among the different types of vises we have today. It is basically a vice used by woodworkers to hold work pieces as they work on them with other tools. The woodworking vice comes in many styles with each of them performing the type of work to be done, specifically. With the variable needs in mind, vice manufacturers have introduced various types of vises, each offering different uses. The face vice is a kind of woodworking vice that consists of two jaws for holding work that includes a screw device used to open and close the jaws. This will help keep in place what the metal or woodworker needs it to. The leg vice is also known as Solid Box or Post Vice. The leg vice typically works by firmly providing support to the ground while a work piece is being hammered, twisted or chiseled. It assures stability every single time. Metalworking vice refers to a type of vice associated with two parallel iron jaws with a wide opening base. The metal jaws are simply used to hold down a work piece as it is attached to a bench that secures its stability. – Fixed, A vice with a fixed base attaches straight to the workbench as it supports stability. – Swivel, The swivel base vice can be rotated so that the position of the vice can be altered to suit activities. – Vacuum, This base work by holding onto the surface of a work piece by sucking. – Clamp, It clamps or attaches a wide size range of metal materials due to its strength and ability to withstand pressure. Engineer’s vice, it is typically heavy-weighted with a thick metal body. It works by clamping large objects for security during projects. Multipurpose vise, it is equipped with integrated pipe jaws and a swivel base for holding a variety of objects/materials. Table vise, it is a portable vice that enables quick clamping that doesn’t involve permanent bolting down onto a bench. This is a type of vice that deals with holding a pipe or tube securely so that it can be cut or threaded. It is a plumbing tool that can also be used as an apparatus in the assembly of components for pipelines. Metalworking vises come in a few varieties which present a set of distinct thoughts in terms of mechanism and uses. This style is made with a high-tensile steel chain that tends to attach a work piece by fastening it to the bench to provide a secured activity. It typically holds loops over irregularly shaped objects. It tends to hold onto pipes between a pair of V-shaped jaws having a fixed bottom and movable top parts. The vise has a hardened steel physical property for clamping properly. This is among the multiple types of bench vise that is portable and be mounted neatly on any flat surface. It is a versatile tool that can have its base lever twisted as it immediately locks in place. Its base can swivel up to 360 degrees and can lock at any preferred angle. It is commonly made of sturdy cast aluminium and particularly equipped with a suction mount. In general terms, the vacuum vise is ideal for any avid woodworker or metalworker that engages in securely detailing work on wood/metal down to a smooth surface. Clamp-on vises are designed to perform clamping of thick work pieces to flat, smooth surfaces. They include sturdy jaws that can accommodate general purpose, light-duty bench work which tends to keep a work piece steady. The clamp on vise is known to work effectively for holding wood or metal to cut or plan. It is made of a solid, cast iron in many cases that is relatively light enough for its user to work around a table easily. Combination vises are the types of bench vises that are constructed to securely clamp straight work pieces and irregular-shaped objects. They are vises that merely combine the functions of a pipe vise with that of a metalworker’s. A paradigm for combination vises includes a rotating design that enhances the exercises of both bench and pipe jaws. They are predominantly used as part of modern plumbing tools today. This is a tool used to clamp small-sized work pieces as they are worked upon. Deducing from its most significant feature, the vise is portable and can be used in any environment where needed. The hand-held vise tends to undergo fastening onto a bench vice in order to hold objects locked down. Relatively, it operates much lighter on work pieces compared to many other vises. This is a hand tool comprised of two connected handles with an integrated jaw on either end. It is typically used for craftworks and home DIY. It is like a smaller version of the hand vise. Due to its particular design, it is deemed ideal for performing smaller holding tasks. Its prominent design is portrayed on the handle with a whole running through it which makes allowance of thin tubes, wires, and rods supported by jaws for clamping. This is known as a tilting machine vise that tends to tilt in order to set up a clamped work piece at any specific angle for machining. The body of the vice can be subjected to an angular (90 degrees) position while the base remains fixed at a point on the machine’s bench surface. In essence, the user can place a work piece in the most convenient position for tasks like drilling. Its tilting feature is suitable for creating angled or diagonal holes through the work piece. Milling applications can also be carried out with this vise such as preparing dovetail joints. There are still some varieties of this tool that have a swivel base added for rotating the vise up to 360 degrees during an activity. Among the flexible types of vise is the adjustable cross vise which constitutes of jaws placed at different positions such that the base is not removed from the bench. One of its significant structural difference is its double mounts (not single) because the tool supports directional changes of an object clamped to it towards north or south positions. The off-center bench vise is mainly applied to the aspect of irregularly shaped or longer objects compared to other vises. It has the swivel feature that can be extended up to 360degrees upon locking down of the work piece to the machine. Off-center vises tend to support horizontal and vertical movements alongside with a slide that has double ribs to facilitate extended accuracy on the work piece. One other interesting feature is its versatility including the ability to be operated as a common vise as well. When it comes to the use of a rotary vise, there is the ability of the tool to rotate around the same axis with that of the hook’s shank. This feature allows its user to tie down material and rotate the hook to apply the work piece. Consequently, this provides improved accuracy regarding the position of the work piece on the machine. Also, rotating the bobbin cradle on the vice almost totally prevents the problems in adding and removing turns of the thread when the vise is subjected to rotation. Sine vises are typically known to use gauge blocks to bring about a highly accurate angle on a work piece. It is a special type that is designed for holding work pieces at a more accurate angle than other different types of vises. This tool is not the casual one that is suitable for DIY jobs on a daily basis. The designation, sine, is actually gotten from the theory of its user having to calculate the sine of angle preferred for the vise. The structure of this tool depicts a screwless kind of vise that stays on two cylinders: one on the axis of rotation of the vise and the other at a specific distance from the axis of rotation. A good tool to keep at arm’s reach when dealing with saw sharpening activities is the saw vise. Some stores sell the saw vise kit which includes threaded screw assembly, sufficient leather to line the jaws/hinge, and threaded brass inserts for the hinge. The assembled weight is relatively light and with built-in clamps used for temporarily clamping to a table. Research shows that the best of antique vises were initially designed for mounting on a bench. 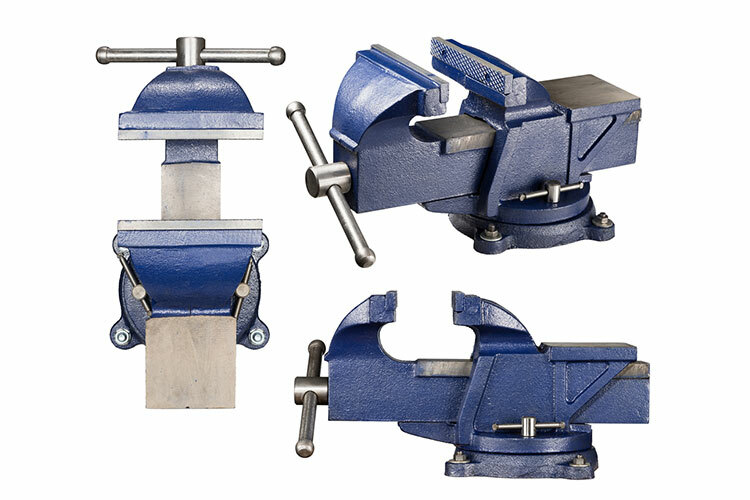 This is a bench vise usually produced of high-quality steel, carburized to surface hardness which makes the tool relatively efficient compared to other inferior types. It can easily clamp any work piece and secure it by rendering steadiness. The diemaker’s vise has great versatility including precision measurement, inspection, precision grinding, and wire cutting. It also caters for enhanced accuracy in any position of a work piece accompanied by single-piece construction with v-grooved jaws. This tool is typically deemed a miniature drill or twist drill. A pin vise can hold onto smaller tools such as drill bits, reamers, small files, and other related sizes of equipment. It also has a chuck head that can be removed and replaced suit various collet sizes that may be inserted. This tool can be gotten in varieties like swivel head pin vise and ball-headed pin vise. Pin vises are DIY tools that tend to create a motion by hand while drilling a work piece. Its chuck is an accessory inserted to initiate a power drill i.e. the force that exists upon drilling. The manual pin vise, however, tends to exhibit better competence with respect to precision on a work piece rather than the power drill. This type of vise can also be referred to a triangular vise or splicing vise with its prominent characteristic of having three jaws. The rigging vise is ideal for performing tasks on a work piece involving closing thimbles, splice rope, wire rope, and cable. It is normally made of aluminium alloy. With the several types and “sub-types” of bench vises that exist, there are higher odds of one getting to misidentify one for another, much less understanding the different application as suit. This is why this article is clearly elaborate on the various types you may find in different stores which will aid you to make correct and appropriate selections. All these vises and their peculiar characteristics equally have specified ways of usage, installation, and related safety precautions. One good aspect is familiarizing yourself with different types of vises and a great supplement will be accounting for how to properly apply their versatility with certain procedure measures. 8 How to Use a Tig Welder for Advanced Metalworking Projects?